In August of 2017, an investor called us and offered to buy our condo for cash. We didn't have it listed for sale. The condo was in great condition, the rent we charged covered expenses, and it was in a very nice area that consistently attracted stable tenants. My husband and I took about five minutes to confer before deciding to accept the offer. The offer was cash. We estimated it was about $10,000 less than we might have made through a traditional sale. After accounting for realtor commissions, taxes, and the time required to sell our condo; we felt the convenience of an as-is cash sale was worth it. The closing took less than two weeks. By the end of August, we had an extra $35,000 in the bank. The investors who contacted us were the building's property managers. They already owned other rental units in the building, so we were able to verify their legitimacy quickly. However, all that glitters is not gold. This industry is rife with scammers looking to swindle you, and you should be careful working with people who advertise a service to buy houses for cash on traditional media sources, online, or even street corners (we've all seen the signs nailed to light posts). 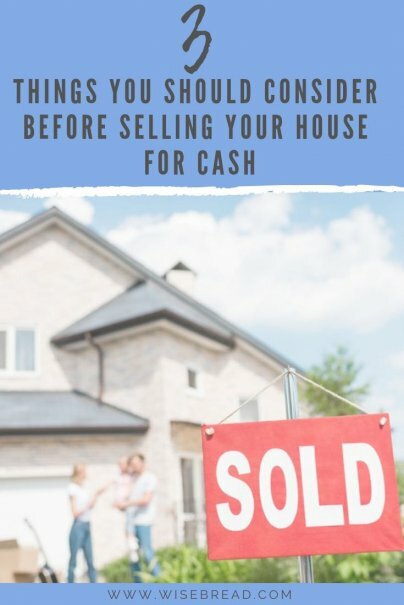 If you're considering selling your house for cash to an investor, make sure you do your homework, and back away if you detect any of the following red flags. People who contact you from foreign countries offering to buy your house sight unseen should set off alarm bells. In some cases, scammers submit legal-looking documents or send you to websites that look professional. They might say they're moving to another country for work. However, these people are either never available to speak in person or don't have a local representative to work with directly. In some cases, the scam artists will send a foreign check with a mistaken overpayment. They ask unsuspecting homeowners to refund the overpayment only to find that the check doesn't clear. This will leave the homeowner on the hook for whatever monies were transferred out. Investors may contact you through a variety of methods. However, once a deal is reached, someone should want to inspect the property in person. If you're dealing with a potential investor who only wants to communicate via email, you might be dealing with a scammer. Legitimate buyers have no problem showing up and walking through a property they intend to purchase. As-is cash home buyers are in this market to find deals. They aren't interested in paying the market rate for any property. The investors will negotiate the price down to account for any repairs needed so they can sell the home again for a profit. Homeowners willing to sell to an as-is cash buyer must be willing to accept a significant reduction in their asking price. If you're communicating with a potential buyer who requires no repairs and is willing to pay top dollar for your home, run. Anyone offering full price for a house without requiring any work on your end is likely trying to rip you off. There are plenty of legitimate investors or buyers who are willing to pay cash for your home as-is. This type of transaction works well for those who don't have the money to make repairs or renovations needed. You may also like the idea of a fast, hassle-free closing. Maybe you've become an accidental landlord after relocating, or you've inherited a house from a family member and you want out of the arrangement. There are plenty of good reasons to approach a quick-buy investor, and homeowners can still make smart choices in pursuing this type of transaction. Here's how to do it right. Always do a Google search and look for independent reviews online. Angry people who are swindled out of money tend to leave a trail in cyberspace. Start with a quick search on the company's or investor's name. You should also check to see if they're members of the Better Business Bureau, or if there are any complaints with the State Attorney's office. While not required, hiring an attorney can help ensure that the process is followed correctly and legally. Legitimate investors will welcome this process. Follow up with their references. Legitimate investors will have worked with other homeowners who can share their experience — good or bad. Keep an eye on their professionalism. If their correspondence is laden with typos, or their forms of advertising are sketchy (illegal posters nailed to light posts, for example), you should avoid them. If an investor doesn't present professionally and you want to sell your home for as-is for cash, find someone who does. Personal finance writer and author of "The Great Debt Dump."